‘Rocking’ bowls. These are great fun. Michael turns these round bottoms bowl with a slight weight and with the shaping of the base so they will happily rock on the spot. They are also great to hold in the palm of your hand (an offering bowl). 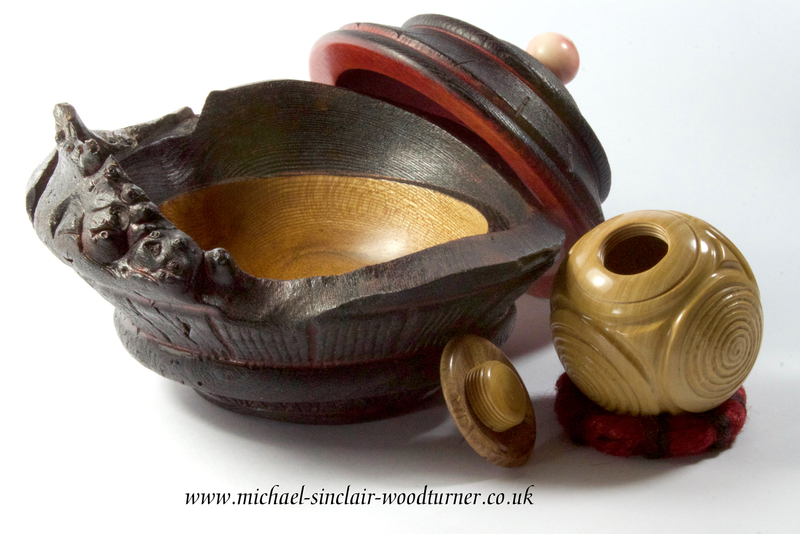 Michael often makes these ‘Rocking’ bowls from a variety of timbers. Some have very little decoration while others are highly decorated using pyrography and occasionally carving. Mace Head turned from Zabrano. These incredible Mace heads (stone) are found in Neolithic dig sites here in Orkney. Michael has chosen Zabrano for his wooden inspired Mace Head as the grain of the wood depicts the patterns found in some of the stone originals. Displayed on an ebonised base, but designed to handle as it is very tactile. This beautiful wall plaque has been made for a customer to go on an original stone wall in an old mill here in Orkney. The couple have bought the mill as an empty shell and are sympathetically restoring it to be their future home. Presently living in Derbyshire they have fallen in love with Orkney after coming here on holiday and are now working towards living here full-time. Michael met with the couple and used their thoughts as well as his own inspiration to create this piece. The plaque is made from Beech and then all the details are added. 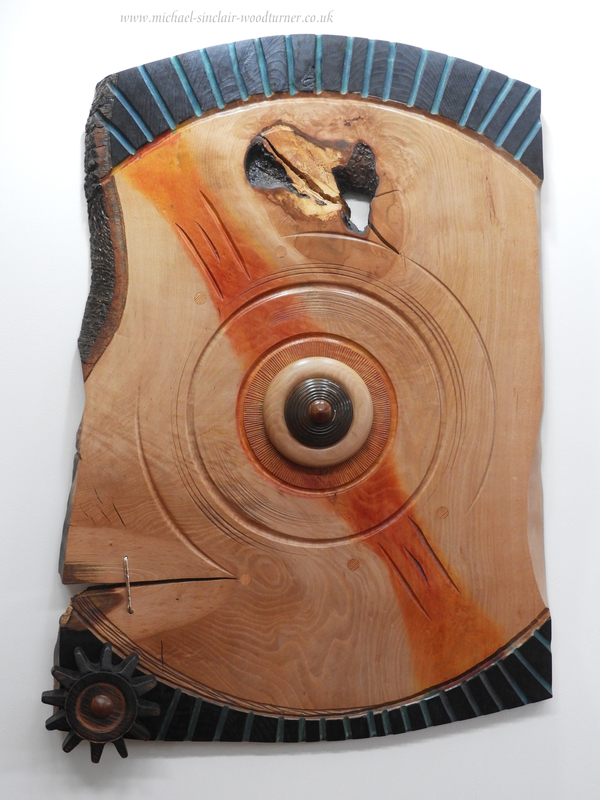 Studs and buttons turned from timber salvaged from the mill, a cog, carved detail as part of the centre depicting a mill wheel and touches of colour, ebonising and bronze staples. A new range of pots. The bowl is ebonised after being turned and then finished with oil. The ebonising also exaggerates the grain of the timber making the it even more tactile. Michael then adds a boxwood amulet with pyrography detail attached using red leather thonging. This particular bowl is round bottomed and sits on a burr elm base. Others in the range are flat bottomed and can also include a lid. This piece was created using several of the techniques Michael uses. We have called it ‘4 points’. It was exhibited at The Pier Arts Centre and now has been purchased for a private collection. 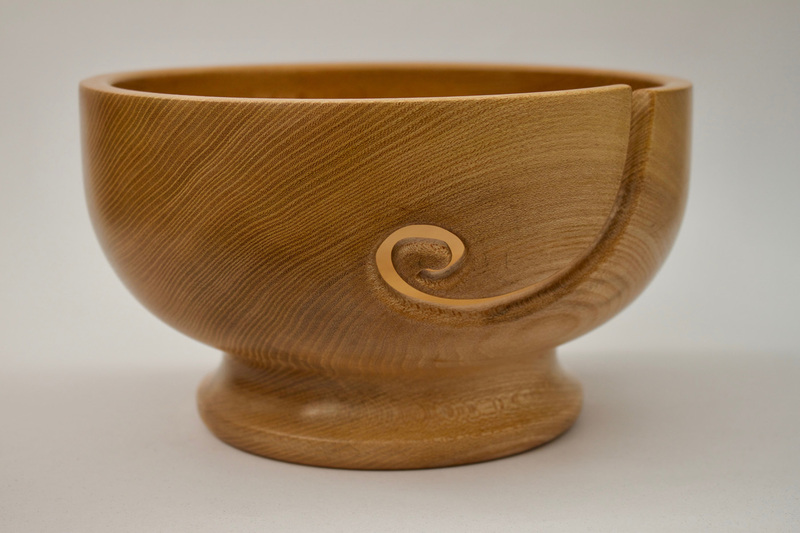 The bowl is turned from olive ash 90mm x 480mm∅. On the rim there is inlaid ebony and a tagua nut button. There is also a silver staple which has the Edinburgh hallmark and our makers mark on it. Underneath the bowl there are bands of patterning depicting the authentic patterns found on Neolithic pottery. 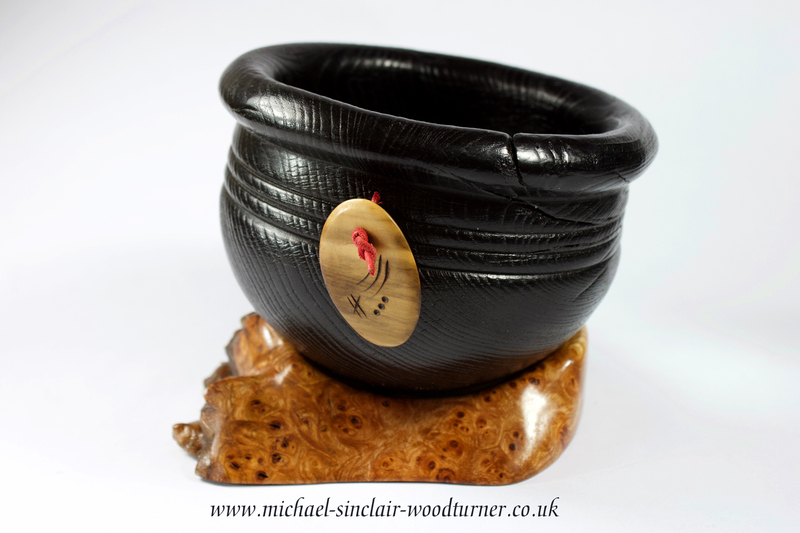 Sitting in the bowl is a yew teardrop 190mm x 160mm∅ at the widest point. This is decorated with pyrography and also has an inlaid piece of ebony. A natural knot feature was embellished with leather threading. Initially inspired by the stone quern bowls with a grinding stone, but could it be a game of chance, or an ancient navigational aid !!!! you decide. 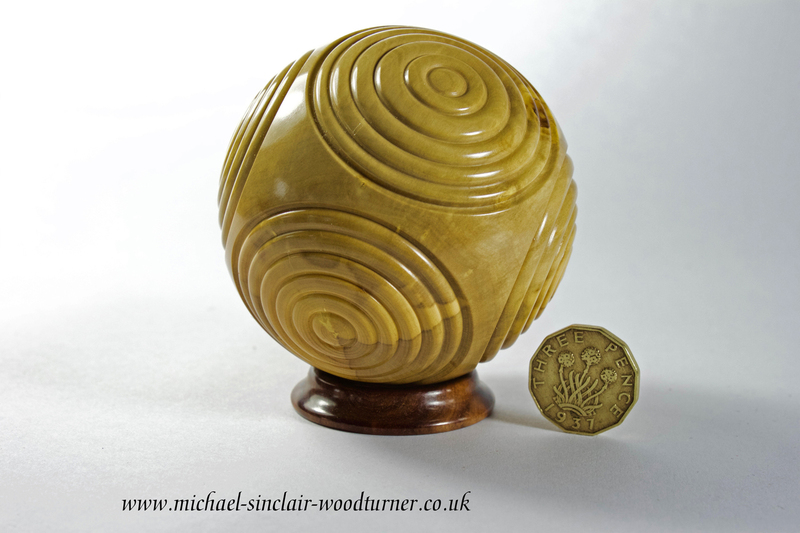 Boxwood ‘Neolithic Petrosphere’ inspired piece. 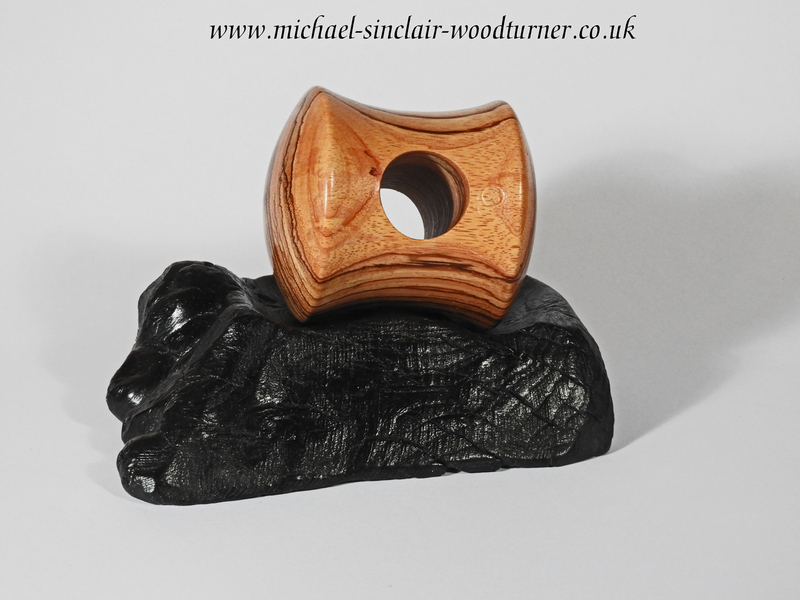 Michael usually turns these pieces inspired by ‘Neolithic Petrospheres’ from English boxwood as this is a very dense, hard wood which gives a extremely smooth, tactile finish. A little stand is turned to keep the petrosphere on (in this case from Raspberry Jam wood). The petrosphere is approx 65mm∅ and sits beautifully in the palm of your hand. Michael will initially turn a sphere and then has made a special wooden chuck to hold the sphere so he can turn the decorations on the various faces. Although based on a theme of either 6 or 4 sided petrospheres, no two will be a-like. A lidded pot turned from elm, with burr and natural edge. The pot has been carved, ebonized and stained with red to give it an aged look. 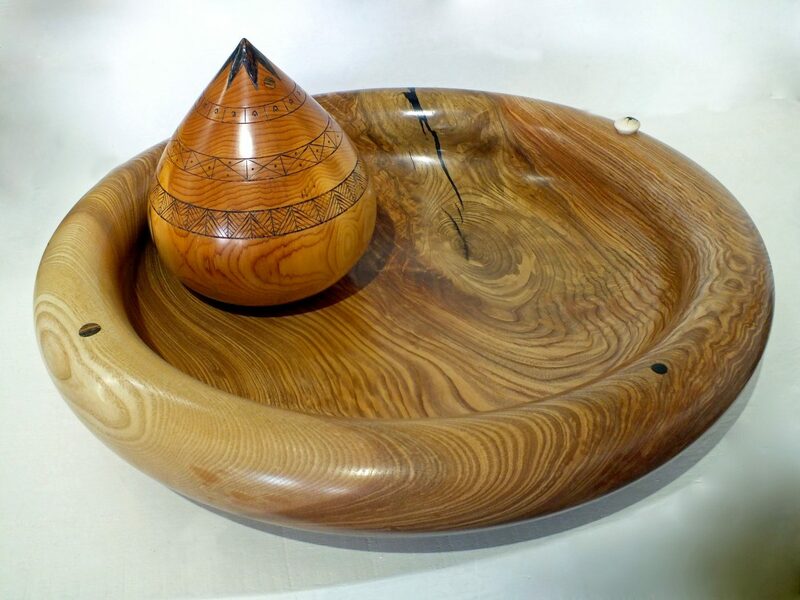 The inside of the bowl has been left natural showing the grain and burr of the elm. 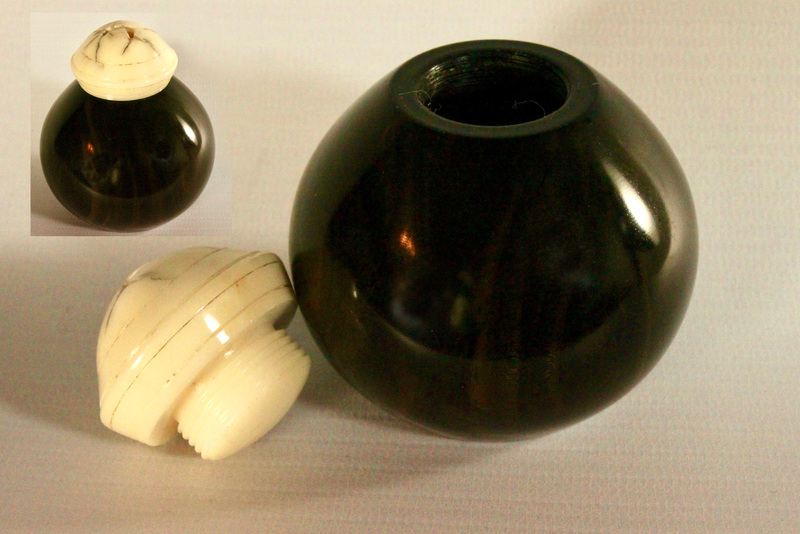 The lid finial is turned from Tagua nut (vegetable ivory). Inside is a hollowed ‘petrosphere’ (inspired by the stone balls found on Neolithic sites) turned from boxwood with a hand threaded elm and boxwood lid. Set on a red jute ring. Was this used as a ceremonial pot with anointing oil held in the ‘petrosphere’ within, who knows you decide. A bowl turned from Orkney sycamore and decorated in Neolithic Unstan ware style. Neolithic pottery and stone carvings have been a great inspiration to Michael and his range of pieces inspired by these finds has developed and expanded. 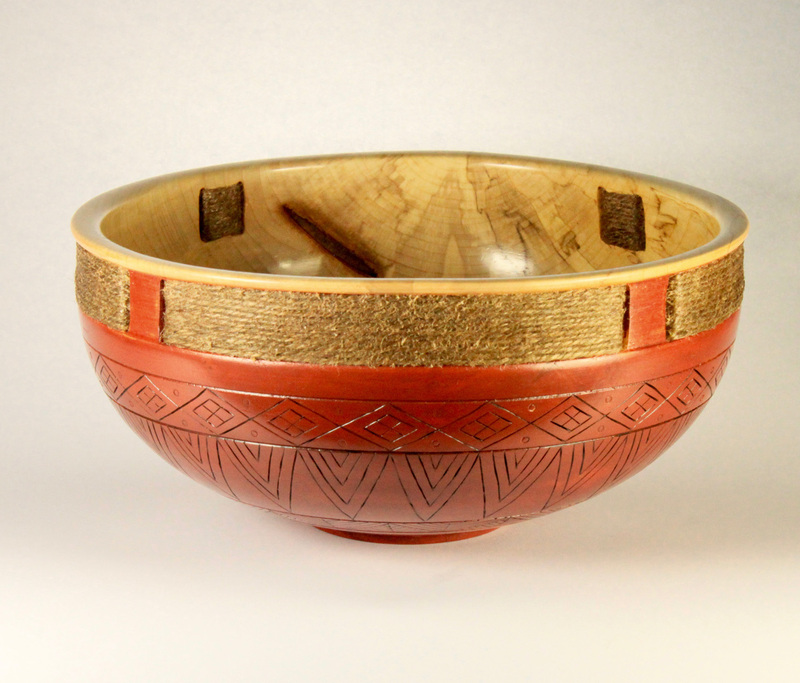 As well as decorating this bowl with pyrographed geometric shapes influenced by designs seen on the Neolithic pieces, it has also been coloured with hematite again used by people in ancient times. Hand carved slits are then used to hold hemp wrapped around the rim. The bowl is finished with several coats of Danish oil. This piece is 110mm x 220mm dia. A little ‘potion pot’. 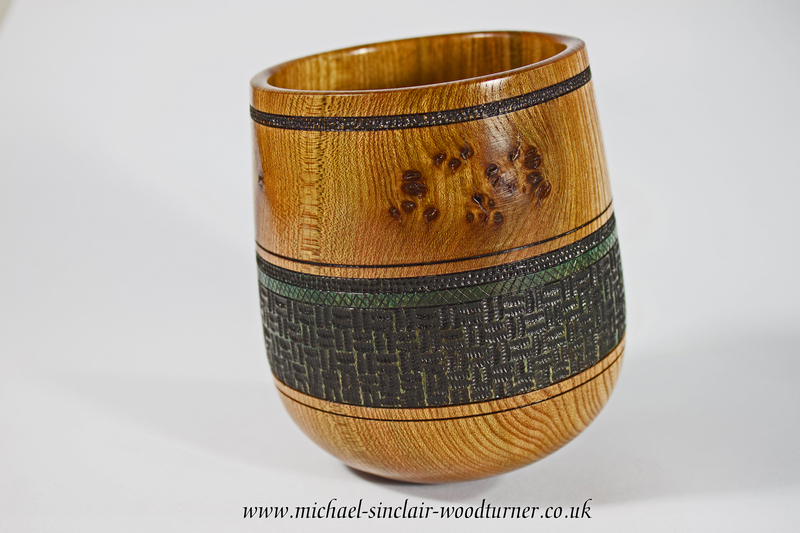 Michael quite often turns these little threaded pots from either exotic woods or stabilised hard woods. They vary in shapes and sizes, but are always hand threaded. This one is made from Blackwood with a Tagua nut lid. Once finished the piece is buffed giving it it’s beautiful glossy finish. 75mm high x 65mm at the widest point.